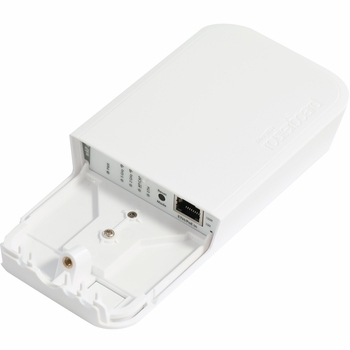 The wAP ac is a small weatherproof wireless access point for your mobile devices, perfect for installation outside your house, in the garden, on your porch or anywhere else where you need wireless access from your phone or computer. The device has one Gigabit Ethernet port, it supports 802.11ac technology and can work at both the 2.4GHz and 5GHz frequencies simultaneously. It looks unobtrusive and sleek. The wAP ac is weatherproof and can be fixed to any external wall from the inside of the case - so that it is securely attached to it’s mounting location. The bottom door can also be secured with a special screw, which can only be opened by the owner. RBwAPG-5HacT2HnD-US (USA) is factory locked for 2412-2462MHz, 5170-5250MHz and 5725-5835MHz frequencies. This lock can not be removed.